The classical nova remnant GK Persei, as seen by NASA's Chandra X-ray Observatory. A stunning new photo shows the expanding celestial fireworks created by a stellar explosion that first lit up Earth's skies more than a century ago. 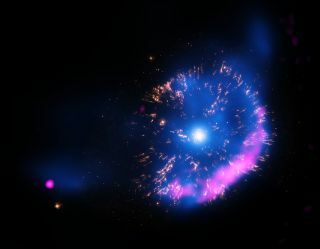 The image, taken by NASA's Chandra X-ray Observatory, depicts GK Persei, a sort of mini-supernova that first appeared in the night sky in 1901. Scientists aimed Chandra at GK Persei in February 2000 and then again in November 2013, measuring the brightness and temperature of the expanding debris both times. But GK Persei's story was far from over. The white dwarf pulled hydrogen gas from the outer layers of an orbiting companion star, accumulating enough material to spur nuclear-fusion reactions. This eventually led to a huge explosion. The white dwarf's outer layers were blown off, in an event known as a "classical nova." The light from GK Persei's explosion first arrived at Earth in 1901 — 1,500 years after the star went boom. For a brief time, GK Persei was the brightest object in the night sky. It has faded over the decades, but the object can't escape the peering eyes of Chandra and other powerful telescopes. The new photo shows Chandra data in blue, optical data from the Hubble Space Telescope in yellow and radio data from the Very Large Array (VLA) in pink. Chandra's X-ray observations reveal hot gas; Hubble's show clumps that were ejected in the explosion, and the VLA data reveal emission from electrons, NASA officials said. Chandra's observations show that GK Persei's debris expanded outward at about 700,000 mph (1.1 million km/h) between 2000 and 2013, moving about 90 billion miles (145 billion kilometers) during that time, researchers said.